Tickets for a seat on the spaceplane are going for $250,000 each. Virgin Galactic’s VSS Unity soared into space Thursday and reached an altitude of more than 270,000 feet — past the 50-mile mark the U.S. government uses to define the edge of space. The Unity's fourth test flight began Thursday morning at the Mojave Air and Space Port in California. The spaceplane was attached to its mothership, WhiteKnightTwo, before being released. Its rocket motors were then ignited, helping to carry the spacecraft into the galaxy. Before its descent to Earth, it reached an altitude of 271,268 feet (51.4 miles). The craft, also known as SpaceShipTwo, was piloted by two veteran pilots, Mark "Forger" Stucky and C.J. Sturckow. Virgin Galactic's founder, Richard Branson, watched the flight from the ground with his son, Sam. Branson had promised to start taking tourists — about 800 people have paid $250,000 each for tickets — to the edge of space by the end of the year. 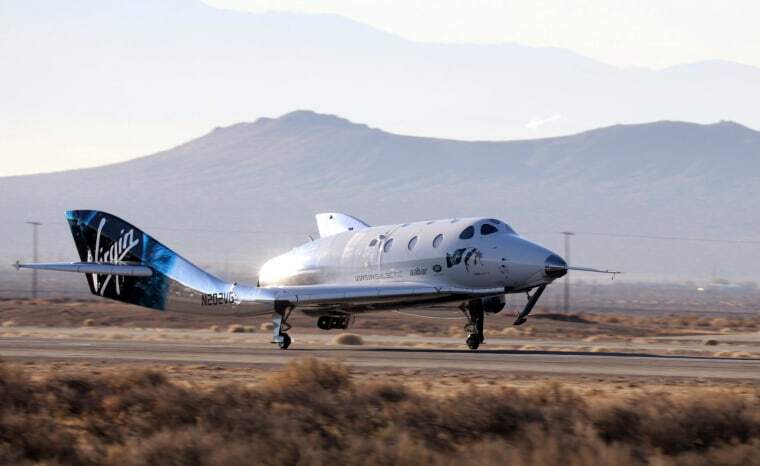 But this test flight over the Mojave Desert carried only a pilot and co-pilot, according to Virgin Galactic. "We plan to burn the rocket motor for longer than we ever have in flight before, but not to its full duration," the company said ahead of Thursday's flight. "At the end stages of the rocket burn in the thin air of the mesosphere and with the speeds that we expect to achieve, additional altitude is added rapidly." The company's goal is to get to the Kármán line, the boundary between the upper atmosphere and outer space, where future space tourists will get to look back at Earth and experience weightlessness. "If all goes to plan our pilots will experience an extended period of micro-gravity as SpaceShipTwo coasts to apogee, although they will remain securely strapped in throughout," Virgin Galactic said before the flight. "They should also have some pretty spectacular views, which we look forward to sharing as soon as possible post flight." In July, during its third test flight, the spaceplane reached an altitude of 170,800 feet (32.3 miles), more than halfway to the goal of reaching the edge of space. Elon Musk’s SpaceX and Jeff Bezos’s Blue Origin also intend to take space tourists up on brief suborbital flights for a substantial fee. It's not clear if VSS Unity will be ready in time to hit Branson's goal of carrying paid customers by the end of December. It wouldn't be the first time the entrepreneur got ahead of himself. After establishing Virgin Galactic in 2004 he said it would be ready for passengers by 2007. This time around the company is at least hedging its bets. "Whether we complete all our objectives during the next flight or need to wait a little longer, we remain committed to completing the final stages of this extraordinary flight test program as quickly, but more importantly as safely, as possible," Virgin Galactic said in its statement.